Formed By The Trigrams: Earth over Mountain. General: Arrogance is the mortal enemy of true greatness. Love: Help draw your partner out of their shell. Business: Do not overlook the quiet achiever in your business. Whether this is a member of staff or an account. Personal: Don't take things at face value - learn to look beneath the surface. 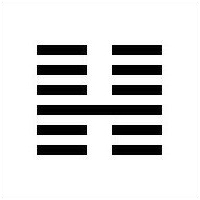 Overview: Ch'ien is related to pride and humility. Although pride in achievement is only natural (particularly among the young) you should not let that blind you. Take pride but in moderation. The most skilled in one field may be totally inadequate in another. Take pride in your achievements but do not think that a skill elevates you above the rest of the world. Learn that our lives are not as comparable as you might think.